Want to learn how to check if values in a range are above a certain threshold? 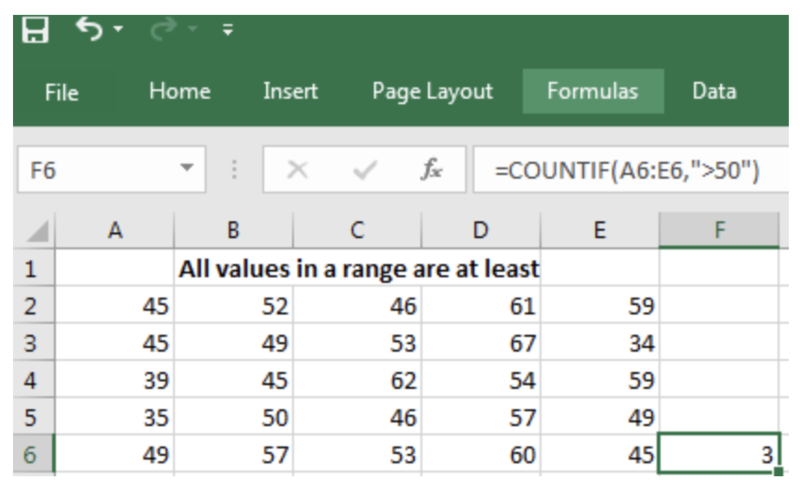 This post will give you an overview of how to do so using the COUNTIF function in Excel. Scroll down the list that displays and click on COUNTIF. The range is the span of cells to which you want to apply the formula. In the example below, it is A4 to E4. Type A4:E4. 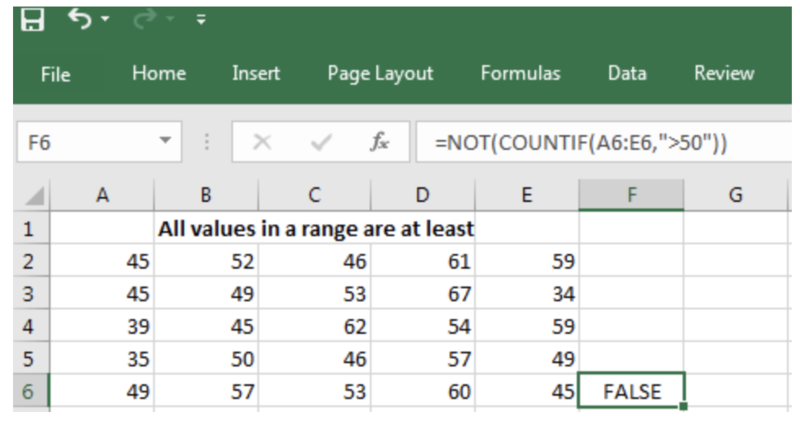 What is displayed above shows that in the row extending from A4 to E4 in the spreadsheet above, using the COUNTIF function to count values that are at least 50, that is, =COUNTIF(A4E4,“>50”), only 3 entries are at least 50. It is easy to look at the table and verify by physically counting that the formula is correct. The only values in that row that are 50 and above are 57, 53 and 60. 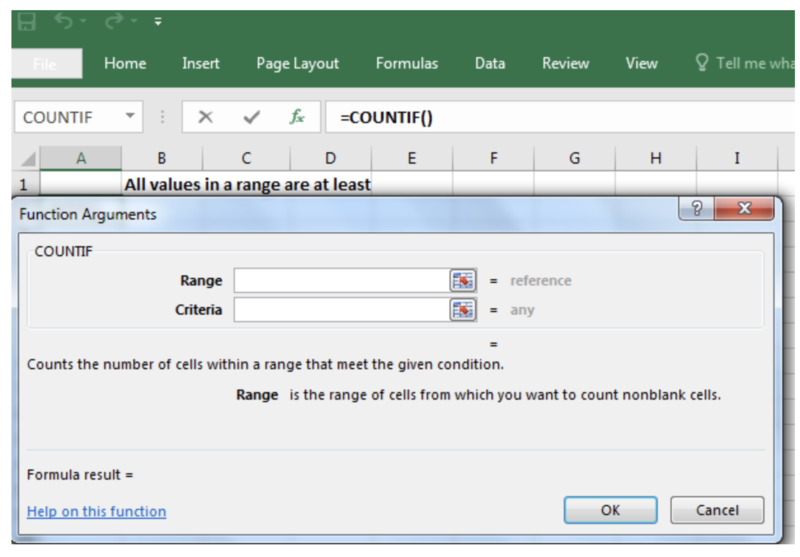 Alternatively, simply type the formula above into the cell on the right of the row you are interested in. Hit the Enter key when you finish typing, and the result will show. Figure 3: All the entries in the range have at least the value of 50. In this case, the formula for F4 indicates that all the entries in the range have at least the value of 50 and above. Since this is not true for the row in question, COUNTIF gives false. Here, COUNTIF will give the number of cells that contain an entry that is at least 50. If there is no such cell, it will give zero. The NOT command is used for displaying the COUNTIF results in True or False format. Where any of the entries fall above 50, COUNTIF will state how many there are, while NOT will give False if some of the entries that fall below 50. In the same manner, where there are no values that fall above 50, COUNTIF will give zero, while NOT will give True, meaning that all the values are at least 50. I would like to use a formula to provide a count of unique values in a range that occur at least 25 times. If all three grades are above 90, then the student receives an A. Otherwise, If at least two of the grades are above 90 and none of the grades are below 80, then the receives a B. Otherwise, if all three grades are 80 or above then the student receives a C. Otherwise, if at least one of the grades is above 80, then the student receives a D. Otherwise, the student receives an F.